Este libro lo sacará de la religión y lo llevará a una relación personal más profunda con el Padre y el Hijo a través del poder del Espíritu Santo. Su vida personal devocional (el armario de oración vea MATT 6: 6) la vida cambiará por completo. Este libro te proporcionará las herramientas que necesitas para adorar en la Sala del Trono del Cielo con los 24 ancianos, las 4 criaturas vivientes y la Hostia de los ángeles (REV 4 y 5). Las vidas de muchas personas han cambiado solo leyendo este libro. Esta es una lectura necesaria para todos los que desean y desean más intimidad con nuestro Abba Padre y El Señor Jesucristo, YAHshua (significa el Dios de nuestra salvación) Mesías. This book will pull you out of religion and into a deeper personal relationship with the Father and the Son through the power of the Holy Spirit. Your personal devotional life (prayer closet see MATT 6:6) life will completely change. 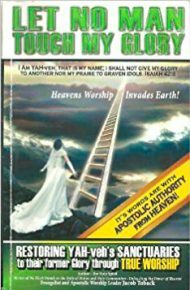 This book will provide you the tools you need to worship in the Throne Room of Heaven with the 24 elders, the 4 living creatures and the Host of angelsm(REV 4 and 5). Many people’s lives have changed just by reading this book. This is a necessary read for everyone who wants and desires more intimacy with our Abba Father and The Lord Jesus Christ YAHshua (means the God of our Salvation) Messiah. Este fue el segundo libro que se le dio al evangelista Jacob Toback en su armario de oración y estos libros son para los líderes y para todos los que deseen devolver el Alter de Dios a las iglesias. Esto es para todos los que han leído el primer libro anterior y tienen hambre de más. Este libro desafiará y provocará a los líderes a profundizar en su adoración personal y corporativa. This was the second book given to Evangelist Jacob Toback in his prayer closet and these books are for leaders and everyone who desires to bring the Alter of God back to the churches. This is for everyone who has read the first book above, and is hungry for more. This book will challenge and provoke leaders to go deeper into their personal and corporate worship. This is the third book given to Evangelist Jacob Toback. This book is directed to the heart condition (pure heart) needed for True Worship. 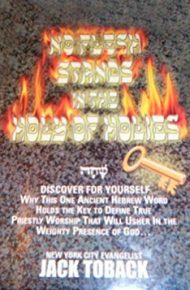 The key to walking in Holiness just one day at a time is a walk of daily repentance (The Lord Jesus is our daily bread) with Holy Communion. Many have had personal healings by using the prayers in this book for repentance before they take the spiritual Flesh and Blood of our Lord Jesus Yahshua Messiah. 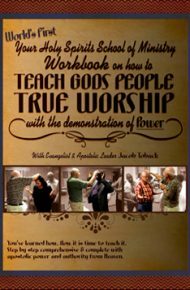 This workbook is for those who have read the first 3 books and desire to teach the True Worship. The workbook comes with a CD. Many are teaching True Worship in home groups and small gatherings, as the Remnant Bride is being prepared for the soon and coming King of Glory The Lord Jesus Christ Yahshua Messiah.